Shuma's first birthday has come and gone (like, a month and a half ago) without mention yet, but don't think we didn't do anything. His birthday is September 20th, which this year was in the middle of the week so rather than one big party we did a series of things. I don't think one-year-olds are really ready to appreciate major fussing anyway, and even if we allowed him to eat sweets he wouldn't be able to have a cake because of his dairy allergy. So he just had a few mini celebrations, starting with a birthday serenade at TGI Friday's in Shinagawa (see here for the full description and an awful, awful picture). 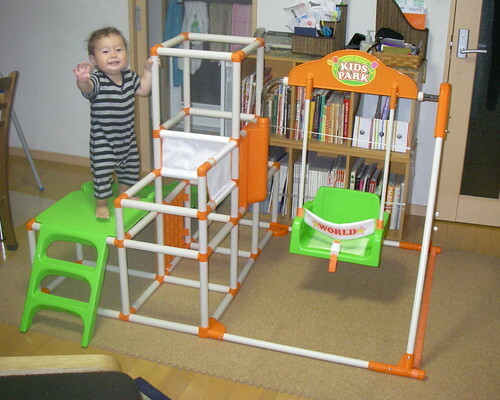 Next we got him an indoor playset. I mostly wanted it for the swing, as I still haven't found a park with a baby swing nearby, but I kind of misjudged how huge the thing is and it doesn't fit in our apartment with the swing addition (it doesn't look that bad above, but there was no clearance at all). So the swing is packed away and will come out when we finish converting our office into Shuma's bedroom. 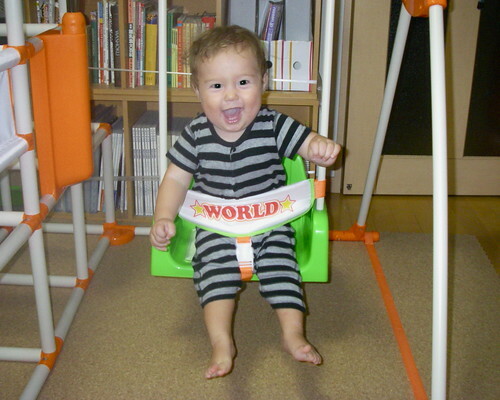 Which I hope to god is soon because even without the swing this thing is huge. He also got the walker seen in this post, which will convert into a scooter when he outgrows it. Yes he is completely spoiled. When I was pregnant we swore we wouldn't buy him much stuff, and now our place is completely overrun by tonnes of plastic baby crap. The thing is, he really likes it all, and since he still doesn't really nap I figure the more distractions he has, the more chances I have to cook, clean, and relax in peace. On September 18th a bunch of Hideaki's relatives got together to honour his grandmother for Keiro no Hi (Respect for the Aged Day). It was a really nice gathering and Shuma got to meet some cousins and great uncles for the first time, and although we weren't specifically celebrating his birthday he did get a cake. Or rather, he got to watch us eat a cake. 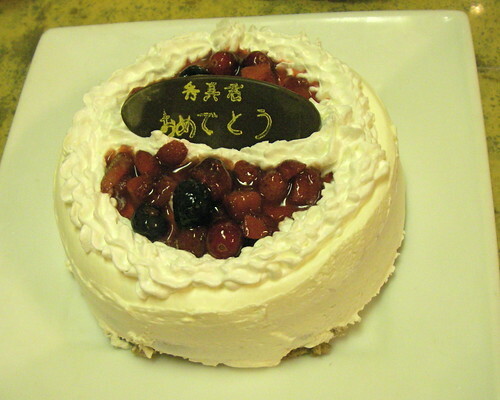 It says "Shuma-kun Omedetou", which means "Congratulations Baby Shuma". Also not specifically for his birthday, but on September 23rd Shuma and I went to Enoshima with Hideaki's sister and her family. Enoshima is a small island in the Shonan area of Kanagawa Prefecture, near Kamakura, and although I've been to the beaches nearby I've never actually made it to the island. 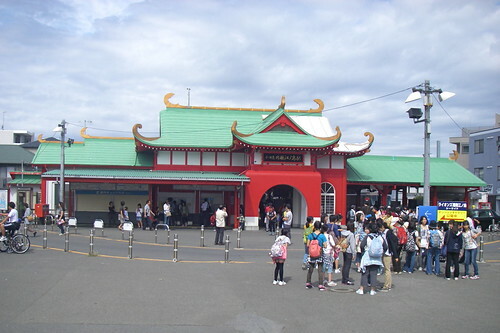 That's Katase Enoshima station above, one of the cuter station buildings I've seen. 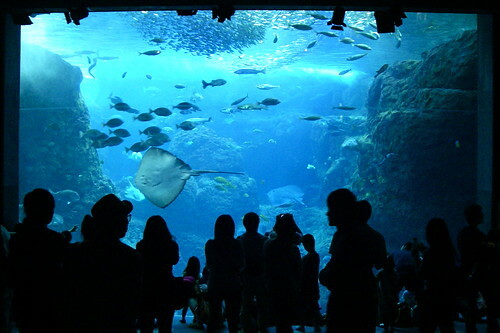 We first went to the Enoshima Aquarium, which focuses on the marine life of the neighboring Sagami Bay. It was a public holiday so the place was packed and it was hard to get close to many of the exhibits, but they seem to have done a great job recreating the amazing biodiversity of the bay. I'd like to return and spend more time there (I say this about every aquarium I visit, but I really really mean it this time). 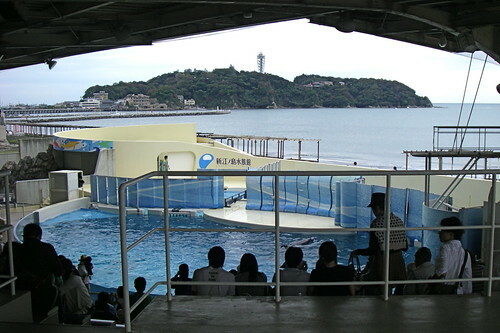 And of course there are seal and dolphin performances, which the kiddies love. I like the way they designed the dolphin stadium (theatre?) with a view of the bay and Enoshima. 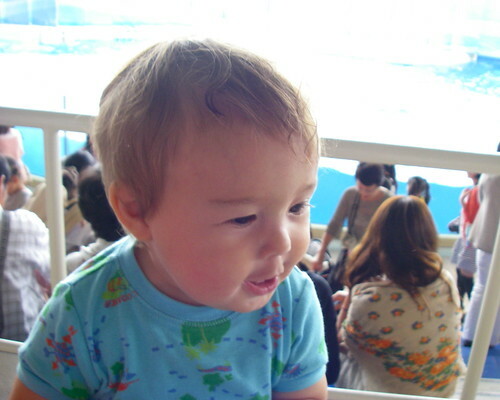 Shuma was a good boy and mostly enjoyed watching the sea mammals but is still a touch too young to really get into it. Or maybe he's like me and prefers the fishes in the aquariums. Lunch was a big treat, as shirasu (baby sardines) is the local delicacy. 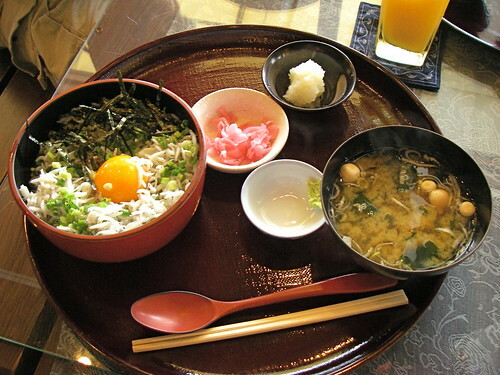 I had tsukimi shirasu-don (moon-viewing shirasu rice bowl, with a raw egg yolk as the moon), which came with pickles, grated daikon and miso soup. Shuma loves shirasu so we both loved this. 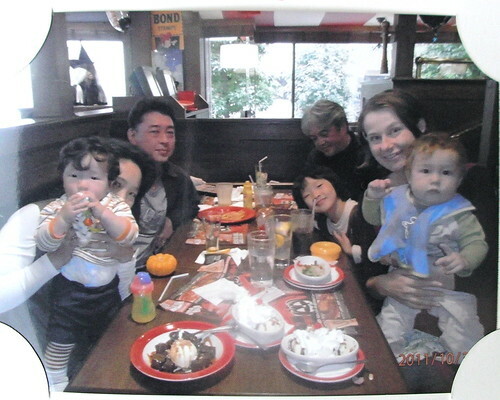 And this past weekend we all got together again for a multi-purpose celebration- Shuma's birthday, Halloween, and cousin Yuuki's birthday (he'll turn one in December, so it's halfway between each of their big days). Again we had the staff bring free birthday desserts and sing (along with the nearby diners) happy birthday. Yuuki was excited, but Shuma was kind of scared- a bit disappointed as he'd just loved the same thing the month before. Oh well, at least we all got to share some yummy dessert. When my first daughter was six months, I think she had something like 8 toys. I was only going to buy wooden, handmade, organic toys. They are now 13 and 8 and yeah, the house (or at least their rooms) is pretty much a toy explosion at the plastic factory. 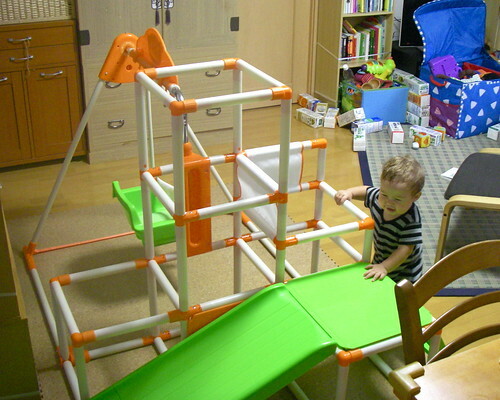 With a few wooden handmade things 8-) That playset is fantastic, and he looks very happy in it! Shuma was born the day before Max. Enoshima aquarium is awesome. It has the best main tank I have ever seen. And I have been to alot of aquariums. The first time I took my daughter to a zoo, she was a little older than Shuma, and it was not a good experience. Animals are fun and exciting when they're on TV or in books, but when they're right in front of your face, it's a little kowai. She really liked the aquarium though, and spent a lot of rainy days there. Donna, that is so funny and I bet plenty of parents had the same delusions. Keitai Goddess, happy belated bday to Max! I think the bar is already set really high for aquariums in Japan, but Enoshima was impressive. It's especially amazing that everything in the main tank is local. That's OK Aspasia! I'll pass along your bday wishes. David, you drove? Traffic always looks like such a nightmare in that area. I think technically only the island is called Enoshima, but it also the general name for that area. And I can see how gently moving sea creatures behind glass are less threatening than animals at the zoo. I can't wait to go to the zoo with Shuma but I guess there's no guarantee that he'll like it.